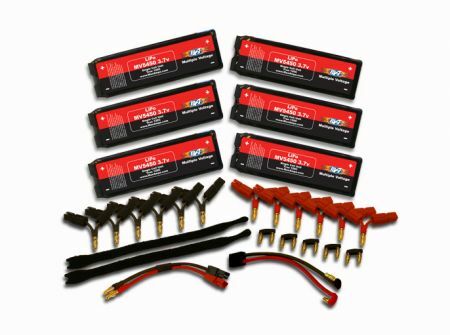 MaxAmps is proud to announce this BRAND NEW technology for the sophisticated rc enthusiast. Get any voltage you want, all in one pack. This product comes standard with one single cell module, one main lead, one charge lead, two "T" style parallel charging connectors, and two velcro straps. One series connector and two parallel charging connectors will be added for each additional cell purchased. Choose additional cells and main lead plug from the drop-down menus. Note: 6-cell kit is pictured for reference. Each cell is its own individual module for easy and fast assembly and disassembly of your packs. With our Multi-Voltage(MV) packs, you can adjust your voltage depending on your application. Perfect balancing on every cycle, better than any balance charger, with the new parallel charging system available only with these new MV packs. 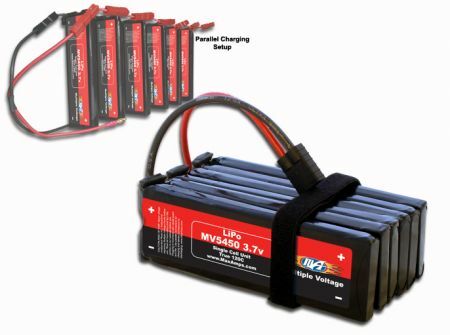 You do not need a balance charger for the MV packs because you are parallel charging as a single 1S pack on every cycle using the included parallel charging connectors. With our Multi-Voltage packs, if one cell fails, you simply replace it with another single cell module and you are racing again. Each single cell unit has a hard plastic case built in under the shrink wrap for added durability. You get the highest performance using parallel charging for perfectly balanced cells on every cycle. Add as many cells as you want in series for running in your vehicle or in parallel to charge the single cell units. Note: ADVANCED ELECTRICAL KNOWLEDGE REQUIRED! VIEW OUR HOW-TO INSTRUCTIONS AND VIDEO BEFORE USE. Awesome packs. Got the 6 cell kit and run it mostly in 2S configuration but the power and punch is amazing. There is a HUGE difference between these and the cheaper packs. Awesome product backed by a great bunch of people make this a must have!